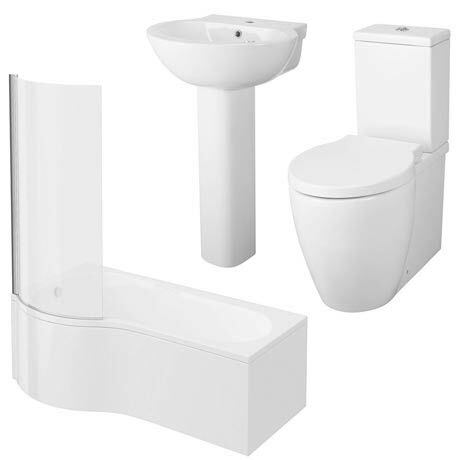 The modern Darwin curved bathroom suite features a stylish close coupled flush to wall toilet with soft close seat, a 1 tap hole basin with full pedestal and a modern 1700mm curved shower bath, inspired by the latest European designers this contemporary stylish bathroom suite with its modern curves and clean neat design will surely enhance the look of your bathroom. The practical curved shower bath provides plenty of space for showering and bathing. Supplied with a 6mm curved bath screen to create an enclosure and a curved bath front panel. Flush to wall design conceals pipework and makes the bathroom easier to clean. The deep curve of the basin provides additional washing space. This basin has a stepped profile where it meets the wall. There will be an element of compression in the thickness due to the bath forming process but the advised overall thickness for the bath tub would be around 5mm.